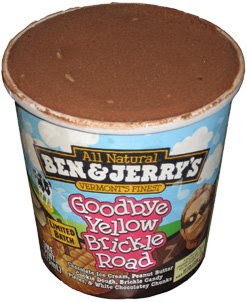 What we have right now in the freezer is a pint of the limited batch of Goodbye Yellow Brickle Road with ingredients picked by the only and only Sir Elton John. (Sorry, had to link, but it explains where the name comes from). So, apparently, Sir Elton's 3 favorite mix ins are Peanut Butter Cookie Dough, Brickle Candy Pieces, & White Chocolatey Chunks. Let's take them one at a time. Peanut Butter Cookie Dough: sounds good right? We all love peanut butter cookies right? Well, it just doesn't work for me. I guess dry is the word I would use. Luckily they aren't in every bite. White Chocolatey Chunks: these bad boys are huge. Actually, they might be the biggest chunks I've ever seen. They aren't bad, but you don't get very many of them. Put those three factors together, and you get an ice cream I just can't recommend. Sure, it's typical B&J quality, but it just doesn't work for me. Oh well, they can't all be great. At least a portion of the proceeds goes to the Elton John AIDS foundation. I have to say this flavour is horrible. IMHO I'm so used to the high-quality of chocolate used in Haagen-Dazs that every time I try Ben & Jerry's I get grossed out. For me the only highlight of this ice cream were the peanut butter cookie dough pieces that were very minimal in the pint I purchased. The 'white chocolatey chunks' and the butter brickle were mediocre.